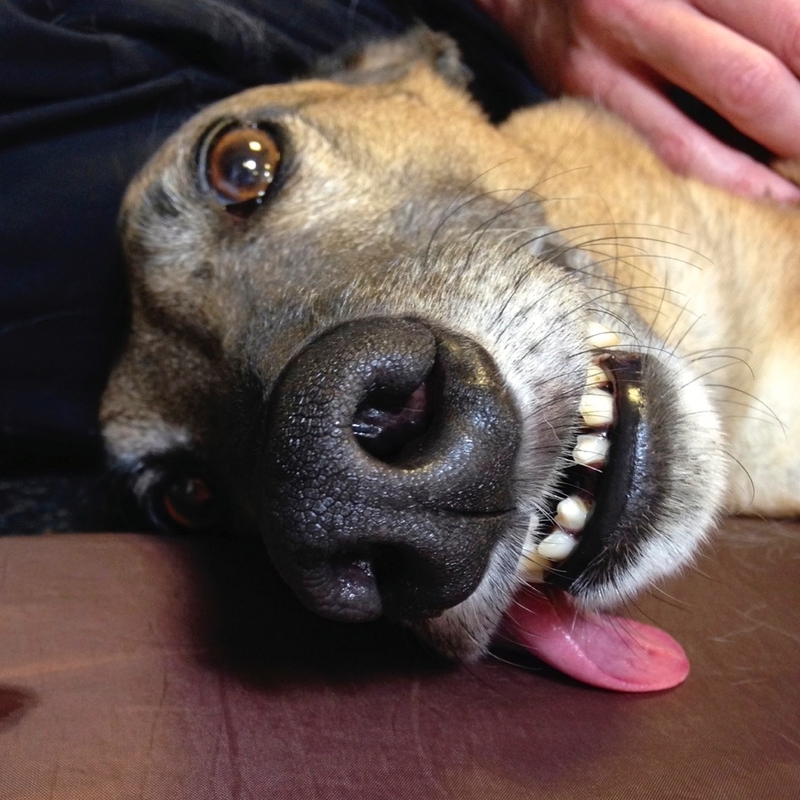 Bob is a very special dog who owes his life to HydroPaws. After our beloved Owen died (see his story elsewhere on this page), Michael went back to visit Karen and her team only to lock eyes with an enormous 4-year-old chocolate labrador who was living at the Humane Society and “just happened” to need a home. Briefly, his story was that 18 months previously Bob had torn his ACL within days of being relinquished and the Humane Society paid to have it repaired. When the leg did not respond as expected, further x-rays revealed he had a deformed femur. He was “un-adoptable” until the day those two pairs of eyes met at Hydropaws. Then synchronicity played its part. Michael and I told the Humane Society that we were used to decrepit labradors and that we were prepared to look after Bob and to continue taking him to HydroPaws for treatment. We were warned by the vet that Bob would never be able to play with other dogs or chase a ball for fear of damaging his leg to the point of requiring amputation or perhaps euthanization. Meanwhile Karen sent Bob’s story via the internet to vets around the world and Dr. Bruecker at VMSG in Ventura responded that he could fix Bob’s leg…which he did within a week. Bob “graduated” from treatment at HydroPaws several months later and no longer needs to visit Karen and the team except to keep in touch. He goes to the park every day, plays with dogs, chases balls and frisbees and, as a side benefit, appears to have developed an iron gut as demonstrated by his consumption of my grandson’s chocolate birthday cake, several loaves of bread and more than his fair share of butter and cheese foolishly left within his reach. I became acquainted with Karen Atlas and the HydroPaws team after my dog Doby had surgery for a broken hip and luxating patella following an attack by another dog. The surgeon said he could fix the injury, but that the key to recovery was physical therapy. I was so afraid that my dog would never use his leg again and would never again have an active and happy life. As soon as I met with Karen at the very first appointment, I experienced an overwhelming feeling of relief and believed that my dog might someday return to a normal life. It’s not just that they have technical expertise; they also have true affection and compassion for all the dogs they treat. And in addition to helping my dog, Karen, Jill and the entire team supported me as well throughout the months-long recuperation period as Doby regained the use of his leg. I can never thank them enough. They gave me my dog back. Our family is so amazed and grateful to HydroPaws for bringing back our Dakota. After finding Dakota completely paralyzed, we rushed him to the emergency veterinarian services in Ventura, VMSG. After days of testing, the veterinarians informed us that they believed Dakota had a dog version of a stroke to his spinal cord. We consulted with the technician at the closest facility to our house in Pismo Beach that offered swim therapy for our dog, but unfortunately the technician was not trained or experienced with such a severe disability and was reluctant to admit that she had little hope for him. Luckily, VMSG recommended HydroPaws in Santa Barbara. HydroPaws did not give us any false sales pitch. Karen Atlas only promised to do all they could and care for him like he was theirs. During our first appointment, Karen went over everything that Dakota had been through with me and worked up a treatment plan. Karen gave me a list of all the different treatments they offered and how they could help each area of the body. Truthfully, in my emotional state, I could not remember them all, but was impressed by the precise and systematic game plan that Karen devised. Karen’s background as a human physical therapist and her additional training in canine rehabilitation helped to ease my mind and she created a treatment plan specifically for Dakota’s needs. Karen, along with her assistants Jill and Kaylene, did hours of state of the art therapy (including cold laser, ultrasound, electrical stimulation, and hydrotherapy to list a few) that I had never imagined was done on anything other than people. They worked with all of the doctors from San Roque Pet Hospital to give him comprehensive care. Dr. Doria, in particular, came on a regular basis to give Dakota acupuncture treatments. The only downside was that we live in Pismo Beach, which is 1.5 hours away from Santa Barbara. The three hour round trip drive to take Dakota to HydroPaws was not feasible to do daily and there are no other facilities that offer similar services in the area. Karen and her staff were able to work out a situation for Dakota to board there during the week, which made it possible for him to receive his therapy. They were not in it for the money. They were wholeheartedly committed to his care. Karen and Dr. Doria came in on Thanksgiving Day, away from their kids and families to be with Dakota. Many of their days off were spent with Dakota. Jill even hand sewed adjustments to a harness to make it more comfortable. They spent time with other specialists brainstorming and designing special orthotics, a standing frame, and eventually a wheelchair, that were all customized for Dakota’s needs. They went above and beyond. That kind of dedication is hard to find in people, much less a business, even in the medical field. HydroPaws, in conjunction with the medical care of San Roque Pet Hospital, brought Dakota back to our family. He now has full use of three of his legs and can get around our home without any help. With the help of his new cart, he is again enjoying his time at the park and can go on longer walks! At home, he can walk outside and go to the bathroom without our help! He can wag his tail! He wags his tail every time he sees the loving and amazing staff of HydroPaws and San Roque; he knows they brought him back, physically and emotionally. Our family is gratefully indebted to HydroPaws. Thank you so much, Karen, Kaylene and Jill, for the big part you played in Kylie's rehabilitation from her TPLO surgery after her cruciate tear. The hands-on work, cold laser therapy, and underwater treadmill sessions were so beneficial in helping Kylie return to regular function on her injured leg. With your assistance, Kylie has been able to return to dog agility, the sport she loves so much. Thank you, Karen, Kaylene, and Jill, for the great work you have done with Maizey. You help keep her tuned up and feeling good for our agility training and trials. She has been nationally ranked the last two years in a row, and finished 3rd out of 150 dogs in her division at the AKC Agility Invitational this past December. We look forward to more agility success in the future, thank you for being a part of our team! I rescued my Lhasa Apso Mix, Mallory, in 2009 and shortly after we discovered that she has a progressive neurologic condition. While this condition is non-painful, she is slowly losing motor control in all of her limbs that will ultimately result in her being unable to walk. I started bringing Mallory to HydroPaws in 2011, and while I knew that there would be no cure for Mallory’s condition, I was hopeful that we would be able to slow its progression. Karen and her staff at HydroPaws have been so caring and helpful in Mallory’s treatment. They tailored a treatment plan to fit her specific needs which includes swimming in the underwater treadmill, electric muscle stimulation, and land-based therapeutic exercises. All of these treatments aim to keep Mallory strong, increase her proprioception, and aid in neuromuscular re-education. Since starting therapy, her disease has slowed considerably and we even saw an improvement in her condition. I am certain that if it wasn’t for Karen’s expertise and her dedicated staff that Mallory would not still be with me today. Karen Atlas at Hydropaws is a true inspiration for canine rehabilitation. We were referred to Karen, a licensed physical therapist with advanced training in canine rehabilitation, after our athletic and youthful 7-year old Standard Poodle, Molly Pie had knee surgery. We were excited, nervous and unsure of what we were in for, but knowing that we were in the hands of a licensed professional was reassuring. It was evident from our first visit that Karen knew what she was doing and that Molly was in excellent hands and was going to receive the quality therapy she needed. Karen and her team not only made us feel comfortable, but it was their knowledge, experience, compassion and support that made the real difference. Karen treated Molly with a variety of techniques that not only promoted a safe and successful recovery for a strong and confident leg, but also prepared Molly for an unexpected second surgery on the other knee. We spent a great deal of time at Hydropaws because of the two surgeries, but every visit was well worth it in so many ways, most especially knowing that her treatment assessment and execution was provided by Karen, the only licensed professional in her field in Santa Barbara. Thanks to HydroPaws Molly is back to her normal activities, chasing balls on the beach, long walks and hikes and loving life. We highly recommend Karen and her team (Kaylene and Jill, also known as the girls in blue) for any therapeutic needs your dog may require – you and your pooch will be treated to something very special. There is no cure for old age, but without a doubt we had an extra year with our beloved Owen as a direct result of the loving care and attention he had from Karen Atlas and her staff at HydroPaws. Even his vet was amazed at how much more mobile he was after therapy. Owen was the happiest Labrador on earth and we felt we owed it to him to keep him comfortable in his old age (he lived to be 14 1/2 years old). He loved Karen dearly. When he arrived for his appointment, he would push to get in the door and then flop down on the floor beside her ready for anything. While Owen is no longer with us today, we are so grateful for the wonderful and compassionate care he received at HydroPaws. Our black lab, Plum, had endured an accident, that put her in the ICU for over two weeks. When she came out, the musculature around her shoulders had atrophied. As she regained her strength, she began showing signs of having developed an arthritic condition. This meant that she was limping severely, and all activities, such as running, swimming, and catching tennis balls were making things worse. We were understandably disheartened seeing our 7 year old black lab, in the prime of her life, unable to handle the activities that made her a happy and vibrant dog. Our next door neighbor, who is an accomplished agility dog trainer, recommended we go see Karen at HydroPaws. And within months, Plum went from not being able to move around for 5 minutes without going lame, to running, swimming, going on hour and a half long hikes, even paddle-boarding, with no pain or discomfort. And the next day, after a good night's sleep, she's up and ready to go all over again. It is truly remarkable. With Karen's background in physical therapy and canine rehabilitation, Karen was able to diagnose the problem, and work with Plum, to get her back to her better self. Karen employs state of the art equipment, such as a water tank with treadmill, and deep tissue ultrasound, as well as a whole variety of fun land-based therapeutic exercises. Plum is interested and happy to go back periodically for maintenance, just like we like going to the gym. Karen also gave us stretching, and strengthening exercises to do with Plum at home, so that we are not only a more active part of the solution, but in turn has created a tighter bond between us and our pet. But probably the most amazing aspect of the whole thing, is the true love and care that Karen and her staff exercise in the rehabilitation of all of the animals we see while in her facility. Of course, we are particularly grateful for her work bringing Plum back to health, but in the larger sense, we are awed by her tireless efforts to bring comfort and fitness back to animals that have suffered more severe injuries and conditions than Plum. Stories that are truly incredible. We are very happy to report that Plum is still swimming, paddle-boarding, sprinting up trails, and shuttling tennis balls back and forth from one place to another for hours on end. All thanks to Karen and her talented & well trained team of caregivers. When Skye tore the cruciate ligament in his knee, I thought his athletic days were over. He is my star performance dog -- the first truly competitive golden retriever that I have ever had. I knew, after much research, that surgery was the only option for us. I also knew that, to be successful, Skye would need intensive physical therapy if he were ever to get back to his prior activity level. Hydropaws was the perfect answer for us right here in Santa Barbara. Karen Atlas and her staff had the necessary experience and knowledge to put together a rehabilitation program for Skye. Starting with cold laser therapy and range of motion exercises and then using the underwater treadmill and focused floor exercises to build strength and endurance, Skye was able to return to health. Karen provided at home exercises and guidelines for his recovery at every step during this process. Her team kept meticulous records of his progress throughout and sent regular updates to Skye's surgeon. Today, Skye is back doing all of the things he loves....we are competing again in agility, flyball and obedience. Best of all, he just gets to be his crazy old self - something that would not have happened were it not for Hydropaws! Our 8-year-old greyhound, Eddie, was on racetracks in Arizona and Mexico for nearly 5 years before he came to live with us, so we were not surprised when he started showing signs of arthritis. Sometimes he would cry out when getting up from a nap, but we thought we had the pain controlled with medication. Then, Fast Eddie started limping sporadically and we finally took him to Dr. Kelly Doria who took an x-ray and saw Wobbler’s disease in his long neck. She recommended we take him to Karen Atlas at Hydropaws for an assessment. That was nearly a year ago – a year without painful cries, and mostly without limping. Three years ago I took my Great Dane to Dr. Bruecker at VMSG. He is an orthopedic surgeon who I have seen for different dogs of mine. Lola was having problems with her neck and hind end. After he had taken X-rays and a CT scan he tried different medications which didn't change anything. So he said "I would like Karen Atlas to get her hands on Lola." At this time he had his own rehab therapist, but he wanted me to see Karen. So, I took her to see Karen as he advised and my dogs have been treated by Hydropaws on and off since then. She has worked wonders with the use of manual therapy, ultrasound, cold laser and the water treadmill. It is a joy to go to Hydropaws! Lola whines a happy whine when we get there and just walks right into the treadmill tank. And this is a dog who hates water! Her staff is amazing, they all work together like a well-oiled machine. They love all the dogs and treat each one as an individual! I have seen many of her patients. It's amazing the progress they make. They all respond to the love and expert care that is given at Hydropaws! Celebrity dog coach including: Oprah, Courtney Cox, Ben Affleck and many more! “I just wanted you both to know how happy I am with Truman’s progress over the last several months. We brought Truman to you after 3 surgeries on his left hind leg. He had just turned 2 and had spent almost a year in a crate recovering. He was limping, barely putting any weight on his leg. I am so happy that his orthopedic surgeon gave him an A+ on his recovery. We all know his full recovery is due to your work with him. I must admit that at first, the thought of hydrotherapy and electrical stimulation treatments for my dog seemed a bit too “California” for me. After Truman’s first surgery his doctor recommended HydroPaws and I dismissed it, thinking I could rehabilitate him all on my own and save some money at the same time. That didn’t work out so well and as it turned out he needed 2 more surgeries! I firmly believe that only with your help is he now able to run around and have a normal dogs life. When we first brought Shiva to HydroPaws we had to either carry her or wheel her around in a wagon because she was unable to walk. It was not a good life for our puppy. Since she was born with severe congenital orthopedic problems (elbow dysplasia/radial head luxations, hip dysplasia, and osteoarthritis in both knees), Shiva required 6 surgeries before the age of only 8 months. After Shiva’s initial evaluation with Karen, we knew we were in the right place. Karen carefully evaluated Shiva and made a treatment plan to meet her specific needs. She helped me to understand her problems and instructed me on what I could do at home to help her. After the intensive therapy done at HydroPaws (swimming/underwater treadmill walking, electrical stimulation, cold laser therapy, and Karen’s hands-on therapy work), Shiva can not only walk on her own, but she can run and play and now even jumps into our swimming pool to take some laps for fun! It is so amazing to watch her have the happy life we always hoped her to have. We are so grateful to Karen and Jamie for all their care, concern, knowledge, and professionalism. They made a very difficult and emotional process easier to get through and I know we couldn’t have done it without them! They changed her life…and mine! I was so worried that Oliver wouldn’t be able to walk again after his surgery but with the help of HydroPaws and the home exercises that were recommended he is doing so well! It’s only been three months and he is practically back to his pre-surgery self! Karen and Jamie were both so knowledgeable about what needed to be done for Oliver’s rehabilitation and were invested in his recovery from the start. I didn’t know much about animal rehabilitation before this experience, but I now feel so lucky that we have a service like HydroPaws in our community! It really changed my outlook on Oliver’s injury and his ability to heal. I’m so grateful to Karen and Jamie for not only the help that Oliver received but the support they offered me during his therapy. Thank you so much!